Stone Man is a family run independent firm of monumental masons based in Bristol and a member of the Guild of Master Craftsmen. We specialise in hand carved lettering in all types of natural stone such as granite, slate, marble, sandstones and limestones. Having worked with stone for over 30 years, Stone Man has gained the reputation of a troubleshooter for all types of stone problems. Whether you are looking for lasting memorial for a loved one, restoration of an existing memorial, commemorative plaques, signage or ornamental stone for the home or garden talk to us as we are sure we can help. We pride ourselves in working closely with all our customers, including home visits without obligation, to meet your requirements. Below is a list of some of our areas of expertise – please do look through our gallery to see some examples of our work. 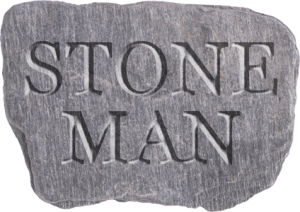 I cannot recommend Stone Man highly enough. Not only is he a lovely guy but the attention to detail is incredible and the craftsmanship is second to none. Thank you!! Couldn’t recommend this guy enough! Brilliant work, nice guy and helped me out in a urgent situation. Highly highly recommended! One of the most passionate and caring man I have ever met and takes pride in what he does. His work is outstanding!